It seems the tourist extracting machine is more evolved in Peru than it is in Bolivia. Before we were even off our bus we were caught up in it when the bus conductor came round and recommended to us a good place to stay. We made the mistake of showing interest so as soon as we arrived we were handed over a lady who whisked us off to a bed and breakfast. Before we knew it we where checked in to a room and booked on a tour of the nearby islands for the next morning. It was all too easy and we were very suspicious, but the room was very nice and fit into budget, as did the scheduled tour. With that all sorted out, we had the evening to explore the town a bit. Puno is a fair bit bigger than Copacobana, and although there seemed to be plenty of tourists, the ratio of real people to tourists is much higher. Luckily for our budget, most of the craft in the stalls was much the same as the stuff we’d seen (and bought) in Bolivia. Prices of things were a bit more expensive than in Bolivia, but still very cheap. Looking in a supermarket, the first we’d seen since we left Chile, we were very excited to find blocks of pure cocoa, at very reasonable prices. The central market was also very exciting for Soph with a huge range of fruits, veg and grains. That night, after failing to find a peruvian dish that suited Sophie’s vegetarian tastes, we resorted to the ever present Chinese restaurant. Although it was a bit of a culture shock to see Chinese people speaking Spanish, I had a good chicken with noodles and fried rice for the amazing price of 7 Soles (just over US$2). The next morning we were back in the tourist machine, minibussed with a bunch of others out to the docks where we were herded onto a boat and chugged slowly out through the reeds. Our first stop was the Uros floating islands. Despite knowing that nowadays they exist largely as a mechanism for extracting money out of tourists, it was nonetheless fascinating to see how they live (or lived). The islands are entirely man-made from large slabs of root material covered with crossed layers of the thick reeds that grow prolifically in the shallows of the lake. The blocks are held together with ropes and wooden pegs, and likewise anchored to the bottom of the lake, over 10m below. On these island they have huts, also built of reeds, and they shuttle themselves between islands on small boats, also built of reeds. 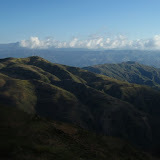 The next stop was the island of Amantani. About 3 hours of slow chugging in the boat, it is an island smaller than Isla del Sol, but inhabited by about 4000 people who still live in a very traditional way, making crafts and farming the terraced fields of the island. It is also a big tourist attraction, with many tourists going out to the island every day, just like us. Despite being a group tour the experience was still a good one. In the evening we walked up to some Inca ruins on the top of the island, through the beautiful terraced fields full of wheat, fava beans and other crops. We were lodged in the house of a local woman, who also provided meals for us. Though very plain, vegetable meals, they were just the sort of meals that are so hard to find while travelling and were eaten with much gusto. After our dinner she dressed us all up in local costume, and the locals put on a bit of a shindig for us. There was a group of boys playing really awesome folk music and much fun was had by all swirling on the dance floor. Again, it was quite strange knowing that they probably do this for another group of tourists every other day, but it was fun nonetheless. The next day we headed off to another island, Taquile. Here we walked across the island, again, marvelling at the beautiful terraced fields with the deep blue lake in the background. 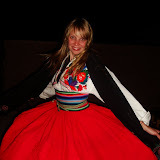 Here too, the locals wear their very colourful traditional dress. We had a chance to browse their hand woven textiles, although due to a finance miscalculation we didn’t have enough cash to buy any. Finally after yet another delicious trout meal, we were back on the boat for our slow 3 hour trip back to Puno. For our overnight bus to La Paz, for the first time, we decided to fork out for the more expensive bus. Though the seats were bigger and more comfortable, being a fancier bus didn’t stop the driver from packing the aisles with additional people. Thus, when I inevitably needed the toilet in the middle of the night, I had to try and pick my way, in the dark, across a sea of people, with various moans, ouches and baby’s cries rising as I went. As luck would have it the toilet was not operational anyway, so I had to immediately part the seas again. On asking the driver about the toilet he simply opened the door and pointed. At that stage we were stationary, so I hurriedly hopped out and watered the back tire of a stationary truck. It was still dark when we arrived in La Paz and so we found a bench in the bus station and waited for the sun to break. An hour or so later we were able to get our first glimpse of the city. The location is stunning, the city being perched high in the mountains at over 3700m. From lower centre of the city, the buildings climb on top of each other up the surrounding hills, something like Valparaiso. However it doesn’t have the amazing colour that Valparaiso has, with most buildings constructed in the absolute cheapest way possible. Like Cochabamba the city is noisy and bustling with activity, the roads absolutely crammed with taxis and minibuses. We soon found ourselves a nice place to stay near the city centre and spent the next couple of days ambling around the city. It is reported that many people have a problem with the altitude in La Paz, however our travels have gradually taken us higher and higher so except for a little breathlessness, we were fine. The highlight for us in La Paz was the shopping. The markets in La Paz were rather serene in comparison with those in Cochabamba. There is a large area of black market electronic and miscellaneous goods. Also there is a witchdoctors market, the most interesting thing on sale there being llama fetuses which unfortunately Sophie wouldn’t let me buy. Of course there is also a large area devoted entirely to stalls and shops selling the local craft, mostly at increadibly low prices. A good day was spent shopping and some nice items were acquired, as always though the backpack space was the limiting factor. The stuff is just so beautiful, but, as in Africa, I was amazed at the limited range of things. The colours change, but all of the shops have basically the same items. Apart from the shopping, there was a lot of sampling of different foods, including a Peruvian food fest that we visited. There were also some interesting museums including a very cool one devoted to the Coca Leaf. During our wanderings one night we happened across the Municipal theater, where we noticed people were queuing. So we investigated and ended up with tickets to see a local folk group play. The show was really awesome, with amazing music as well as traditional costumed Bolivian dancers. Sophie was absolutely enthralled. On our last day, we had just enough time to check out some of the city’s viewpoints. Some of the views that can be had are just stunning. Next thing we were on the bus out, with the trip out of La Paz offering even more amazing views of the city as the road winds up up up the hillside. Next stop, Lake Titicaca. According to our Frommers guidebook, Cochabamba is a relaxed place…. I don’t know how many coca leaves they’d chewed when they came up with that description. The place is huge and sprawling and the traffic is insane. The roads are packed, mainly with the various types of public transport, who drive aggressively and use their horns like a bat uses its squeak. The sidewalks are also really narrow and crowded. So despite the initial shock, we managed to find ourselves a room and immediately had a quick nap to recover from the overnight bus trip. One of our main reasons for visiting, besides the promised “relaxed atmosphere” was the promise of numerous large and authentic local markets, so after recovering we ventured out to find “La Cancha” the local Cochbamba markets. We found them and they certainly are large. They are the most insane markets I have seen so far. Seeming to go on forever they are just packed with absolutely everything: fruit, veggies, clothes, meat, shoes, belts, illegal cds and much more. Large sections inside were devoted to food as well, with hundreds of people sitting and eating meals, and of course everywhere were small stalls selling delicious snacks, juices and bread. It was an assault on the senses. We saw everything you could possibly want except the local crafts we were looking for. We wondered for hours through the crazy stalls and roads packed with hooting buses before we found the single row of craft stalls. In the end it didn’t really have anything we hadn’t seen in Uyuni, and at that stage we were so marketed-out that we didn’t stay too long anyway. The next day we continued our quest to find unique local hand crafts. 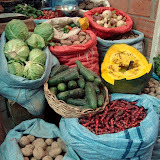 Around Cochabamba are numerous little towns and villages, also promising authentic local markets. So for the ridiculously small price of 5Bs (less than a dollar) we hopped into a taxi with four others and did the hour or so trip to the first one. We spent the day hopping from one village to the next, but alas, although the markets we found were authentic, local and very interesting, they did not have a single piece of handicraft. It was a great day though. The tiny towns were amazing. The first one, Tarata, consisted of seemingly ancient buildings, built of mud with huge old wooden doors and decrepid undulating shingle rooves. Judging by the looks we got from the locals, not too many tourists make it out to this part of Bolivia. At one stage we found ourselves, as the result of a hot tip from on the the locals that we may or may not have understood properly, in the tiny town of Huankuli. There was nothing there, not even one of the ubiquitous kiosks. So we had a peaceful hour or so sitting in the square, watching daily life pass by. A small boy helps his dad bring the cows home with limited success. The boy chases the escaping cows. Locals congregrate for church in their black church garb. I can’t image what they would have made of us sitting their for an hour or so before being shuttled off again. The other towns we visited were Cliza, an ugly town in which almost every building seemed half constructed, and Punata, a bigger town with a really nice fresh produce market but again, not handicrafts. 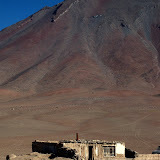 So despite failing our mission, a very interesting day exploring some of the rural towns of Bolivia. The next day, we started with a an annoying search for a shop mentioned in the guide, which failed to mention that there are two instances of the street where the shop is supposedly to be found, and that the numbers on those particular streets are in a completely random order. So we failed to find that too, despite enlisting the help of a keen taxi driver. In the end we found the crafts area of the town, lo and behold, right in the middle of the city, a few blocks from our hostel. 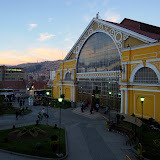 So we spent the rest of the day shopping, had another super cheap chicken and chips for dinner, before once again heading to the bus station to catch our bus to the capital La Paz. Adventures of Dean and Sophie is powered by	WordPress 2.8.5 and delivered to you in 0.231 seconds using 33 queries.